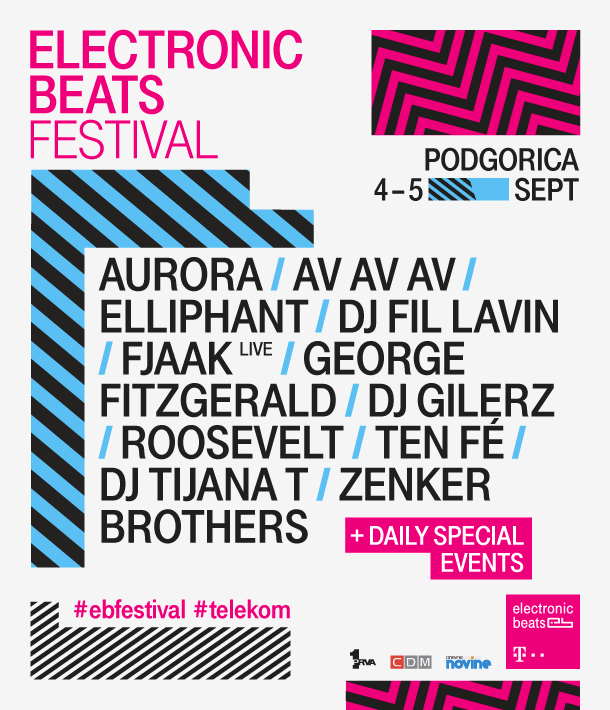 Electronic Beats is kicking off its fall 2015 festival season with a two-day blowout in Podgorica, Montenegro. Over the weekend of September 4 and 5, we’ll host a combination of day events, concerts and club nights around the city. Doors open at 20:00 on both nights, and our after-hours parties kick off around midnight. The proceedings begin on Friday at 13:00 on Bokeska Street, one of the liveliest spots in town, where we’re hosting a street fair. DJ AudioStorm (one of Montenegro’s 10 best DJs) and Mr. Jools will play all day while fashion designers Milena Djurdjic and Boris Calic will create an EB-themed dress and show their wares alongside jewelry maker Katarina Zlajic at Sejdefa Bar. The concerts begin at 20:00 with local DJ Fil Lavin, who will open at Karver ahead of performances by the Copenhagen-based electronic trio AV AV AV, Greco-Roman’s Cologne-based singer/producer Roosevelt and Swedish singer/rapper Elliphant (AKA Ellinor Olovsdotter). The latter made waves with a 2014 single featuring Skrillex, “Only Getting Younger,” and her two albums, A Good Idea and One More, saw releases on Universal Music/TEN Records. Starting at midnight, we switch to club mode at District with Podgorica’s own DJ Gilerz. He’ll warm up for pop-house producer George FitzGerald, whose debut album Fading Love dropped via Domino earlier this year. His earworm melodies and big-room percussion have drawn audiences of all stripes, but he’s kept a foot in the electronic music underground with releases on labels like Hotflush and Aus. Closing sounds will come courtesy of Belgrade’s DJ Tijana T.
On Saturday, we’re hosting another street fair at 13:00 on Novaka Miloseva outside the Blues Bar, where homemade beer will be served all day while DJs Igor Stanovnik (the “father of Montenegrin house music”) and Sensible Seed play tunes. We’ll also have a number of local craftspeople at work: Adin Rastoder will sculpt, Dejan Batricevic will illustrate and Nemanja Bojanovic will paint. We’re also partnering with Festival Internacionalnog Alternativnog Teatra for the opening of the play “Where’s The Revolution, Scum?” Entrance is free and more information is here. At 22:00 Bosnian band Zoster will perform on the rooftop of KIC Budo Tomovic; entrance is 5 euro. By then our 20:00 concert at Karver will be underway with Fil Lavin and TMTS indie darlings Ten Fé. The UK duo won us over with their combination of washed-out electronics and updated Britpop, and they have an album in the works with Ewan Pearson. Norwegian-born newcomer AURORA will share the bill. Her moody, ethereal pop reminds us a bit of Sia and recently appeared via the 2015 EP Running with the Wolves. To close out the night, DJ Gilerz and the Zenker Brothers get behind the decks at District starting at midnight. Dario and Marco Zenker head up the Munich-based Ilian Tape label, and their recent debut LP, Immersion, earned a recommendation from techno figurehead Marcel Dettmann. Sharing duties on Saturday night at Alan Ford are Tijana T and FJAAK, the Berlin techno trio and recent Slices New Faces stars signed to Modeselektor’s soon-to-be defunct 50Weapons label. 13:00-20:00 @ Blues Bar on Novaka Miloseva Street: Street fair with DJ Igor Stanovnik & DJ Sensible Seed, sculptures, illustrations and more. Tickets and entry will be limited based on the capacity of the venues, so there will be 200 tickets available for events at District, 350 for events at Alan Ford and 650 for events at Karver.